This trip was made possible with the sale of a large cartoon painting from my temporary gallery in Thunder Bay. Thanks Brian! 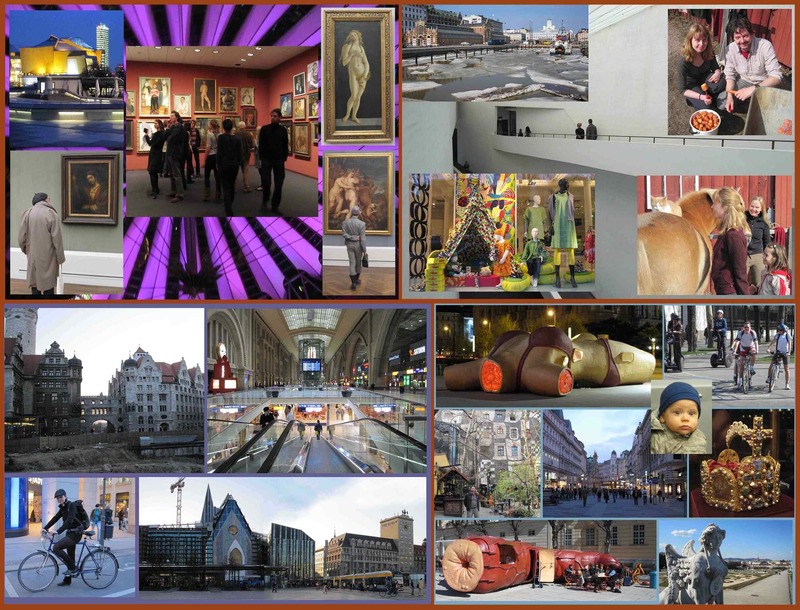 The photos above are of Berlin, Helsinki, Liepzig, and Vienna. 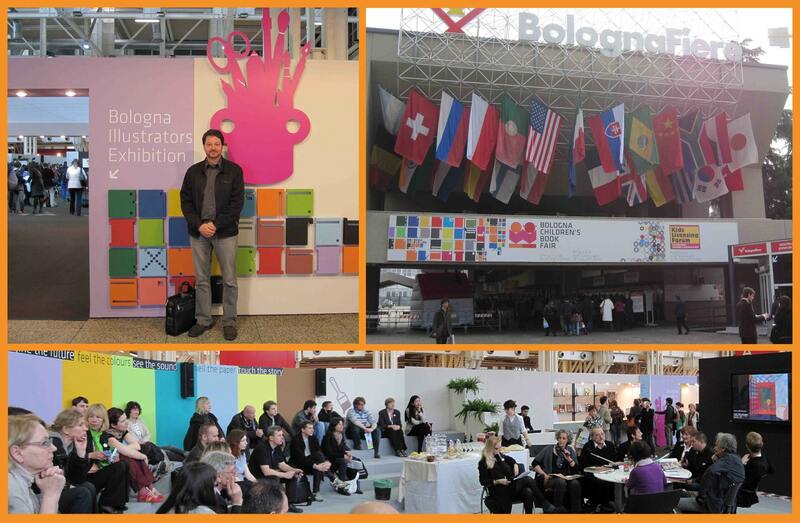 I also visited Bologna, Stockholm, Dusseldorf, Roermond, Frankfurt, Antwerp, The Hague, Maastricht, and Amsterdam. My trip was extended due the Eyjafjallajokull Volcano ash canceling flights across Europe. I visited many art museums, and spent many hours every day walking the cities, often getting joyously lost. I saw work by some of my favourite artists. Inspiration came from all over. I made friends and had a few good interviews. In Roermond, Holland I stayed with friends I made in Bologna, Barbara and Gerard. They were fantastic hosts while I waited for the ash cloud to clear, but I stayed a little longer to see a couple more cities. The Netherlands have wonderful bike paths and I did a lot of biking in Roermond. I hope to return soon. Carol Cooper and I had a show of our digital images in gallery 3 of the Definitely Superior Art Gallery, in Thunder Bay. Samples of Carol’s many series can be seen at http://www.compasswebworks.com. Carol continually plays with new programs and applies what she learns to new series. Most of my work in this show was created with specific functions in mind, such as creating a theatrical image for a brochure or monoliths as a submission for a sculpture competition. I love dropping people into surreal scenes too. With Michael Rapino (CEO of Live Nation Entertainment) and Shy-Anne Hovorka (singer/songwriter – http://www.shy-anne.com) we are aiding our alma mater in recruiting students. A great honour. 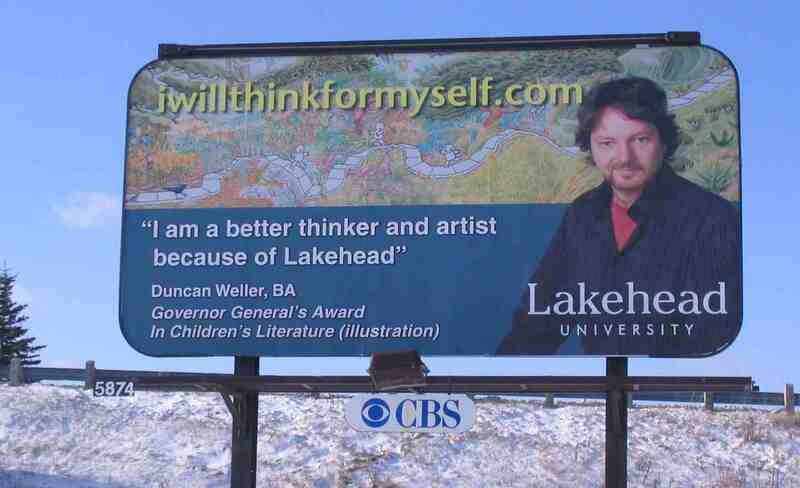 Rarely are artists featured in billboards (rock star status in Barrie – along with bus shelter and subway posters in Toronto!) Students at LU are wearing T-shirts featuring The Boy from the Sun. 3,000 Ts were handed out for free in Toronto. I’ve got a few I’m proud to wear. While biking a child saw my shirt and yelled with possessive authority, “I have that book!” I yelled back, “I wrote that book!” The boy’s older sister burst out laughing, as her brother grimaced like he’d been bested. I’m organizing 50 artists, musicians, and writers into 20 retail locations, including galleries for this annual event. I’m taking over from local artist, Linda Dell. 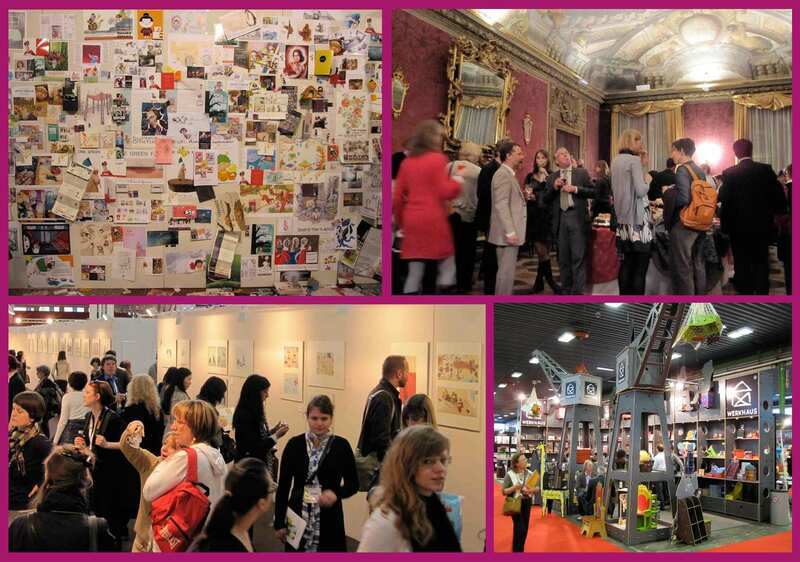 Art Zoom is a great way to get hundreds of people into shops and seeing art they otherwise wouldn’t without this event. The Thunder Bay downtown cores need help and the arts, as everyone knows, has proven to do this very successfully. Over 100 original works of art are on display at 12 St. Paul St., Thunder Bay, ON. Over sixty people attended the opening and I get about 30 people a day. Special Thanks to Dorothy Hanson! And thanks to Shaw Cable, CILU Radio, The Source, and The Chronicle Journal. 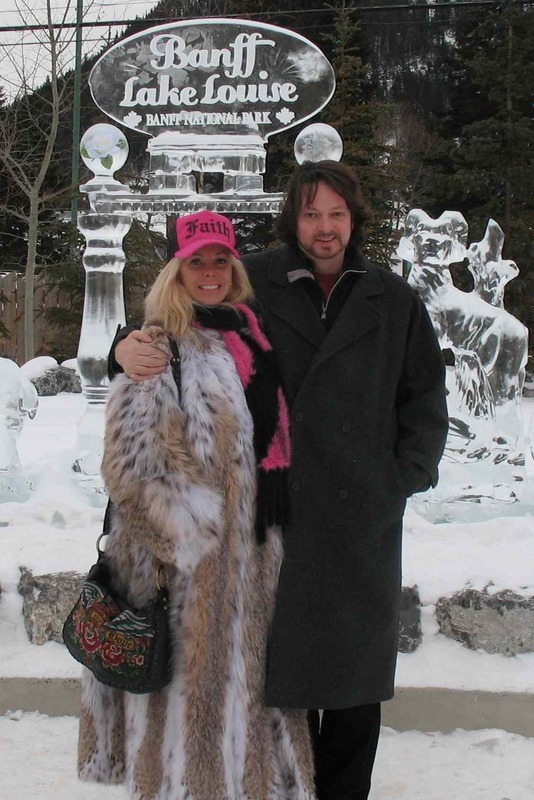 I was a guest at the “Banff Mansion” over the Christmas holidays with LuAn Mitchell, one of Canada’s most famous entrepreneurs, and one of the top 40 in the world. LuAn and her wonderful children made me feel at home. This was my first trip to Banff. LuAn is now a writer and speaker who was the owner of Mitchell’s Gourmet Foods. LuAn gives talks and attends events all over the world. She is a philanthropist and donates her time to worthy causes. I had no idea who she was when I asked her out for a coffee in Victoria. We met waiting for an elevator. LuAn has been a great inspiration.